This Refugee Rights Month, if it is safe for you, we invite you to share your story. Through the month of April, we will post stories of the refugee experience on our Instagram, Twitter, Facebook, and Blog. You can make a video, write a blog post, or share a picture. You can write, draw, film, paint, dance, or sing. We invite you to tell your story in a way that is meaningful to you. You can share your story in the language you are most comfortable. Telling our stories can be a powerful experience. It can bring healing, strength, awareness, and encouragement, both to the storyteller and the listener. If it safe for you, and if you feel ready, we invite you to share your story. 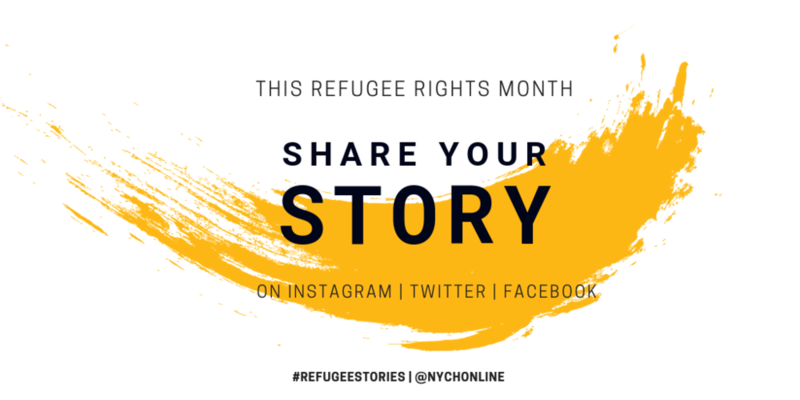 When you post your story online please tag @nychonline and use the hashtag #refugeestories so we can see your stories and share them on our social media pages and website. You can also email your story to us at nych@nych.ca.